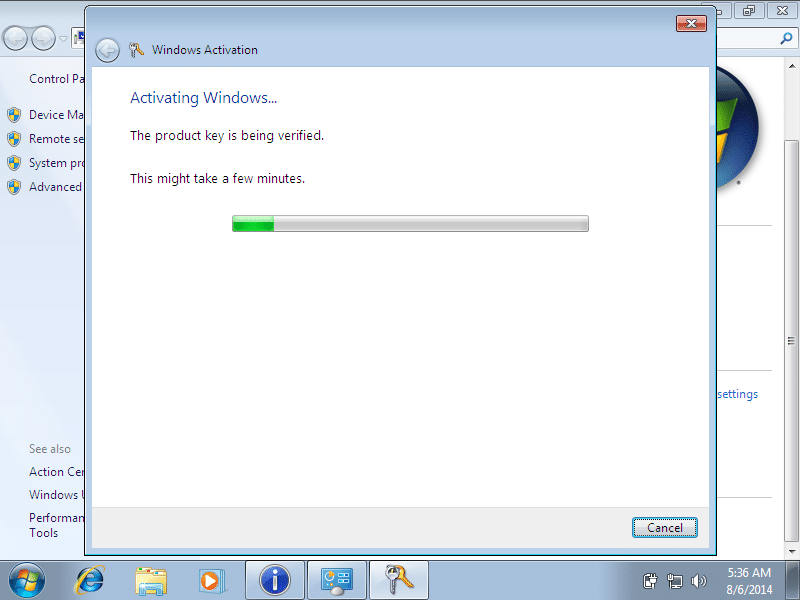 Reinstalling Windows 7 operating system is fairly a simple job. You prepare a bootable media, boot using the bootable media, select language and keyboard, accept license agreement, enter the product key, and select a partition to begin installing Windows. The problem with this traditional procedure is that you need to enter the product key. This becomes a bit more complicated if you have lost your Windows 7 DVD box on which license key is printed or if you have deleted the mail containing your product key for Windows 7. 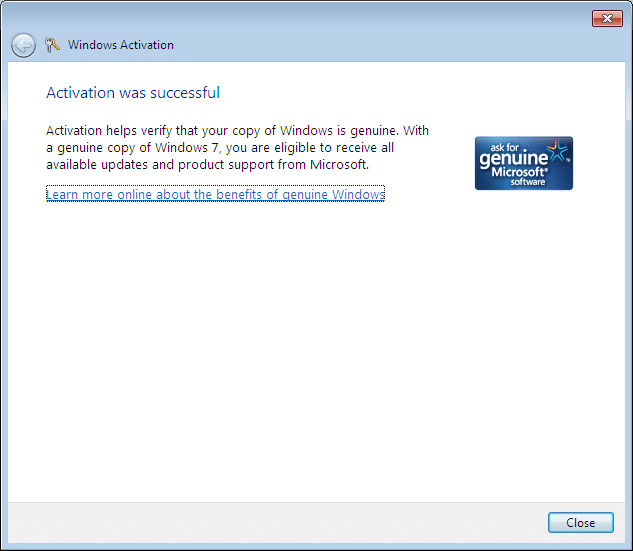 While there are plenty of applications out there to recover Windows 7 product key, including a free tool to recover Windows 7 product without booting into Windows 7, wouldn’t it be good if it was possible to legally re-install Windows 7 without entering the product key? 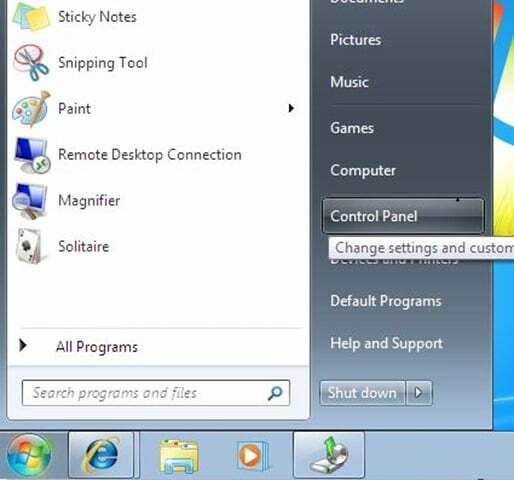 The beauty of Windows 7 and one of the hidden features of Windows 7 is that this version of Windows can be re-installed on the same PC without having to enter the product key, legally. 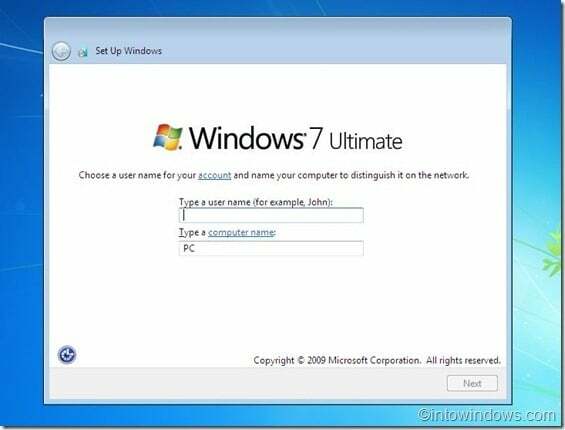 In other words, if your Windows 7 PC is working and bootable, you can re-install Windows 7 without a product key without the help of third-party tools provided that you have a Windows 7 installation DVD. Note that you must use Windows 7 installation DVD as a bootable media as a bootable Windows 7 USB doesn’t help in this method. 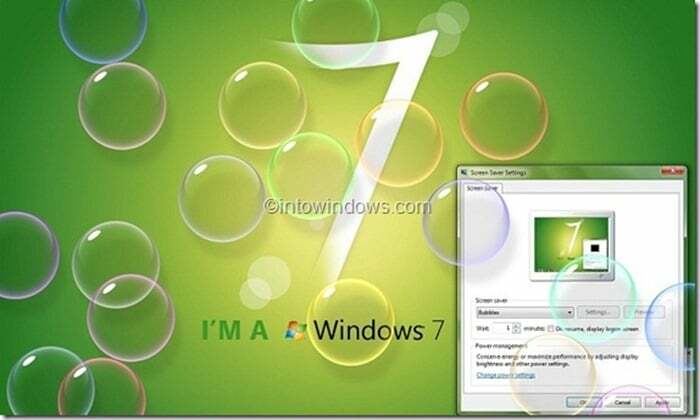 # This guide is helpful for those who have a Windows 7 DVD but not the product key. 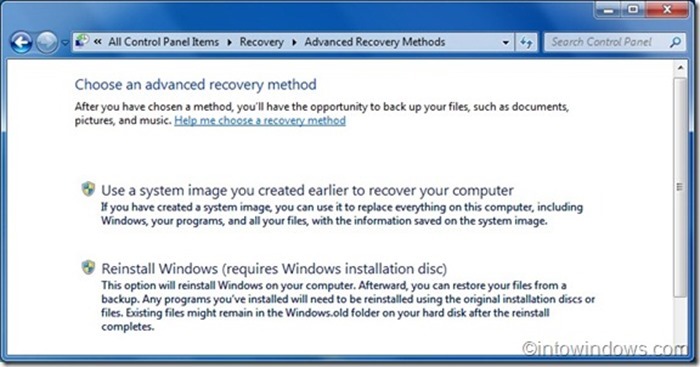 # Your Windows 7 PC must be bootable and your PC must have an optical drive (DVD drive). # Your PC must have at least 16 GB (for 32-bit) and 20 GB (for 64-bit) of free space on your Windows 7 drive (the drive where Windows 7 is currently installed). If there is no sufficient space, you need to free up some space by disabling hibernation, uninstalling programs, emptying Recycle Bin, or running disk clean up utility. # After performing reinstallation, you’ll need to manually install all applications all over again, meaning you will lose all installed applications during the reinstallation. 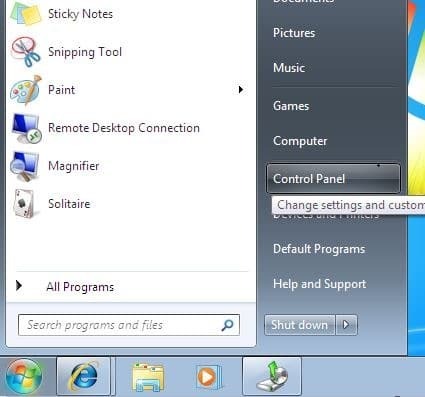 Step 1: Turn on your PC and boot into Windows 7. Make sure you have above mentioned free space before continuing further. Step 2: Navigate to Start menu, click on Control Panel to open the same, change the View to Small icons, and then click on Recovery to open Recovery window. 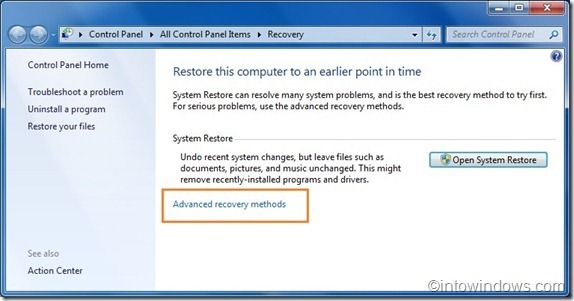 Step 3: Here, under System Restore section, click on the option labelled Advanced recovery methods. 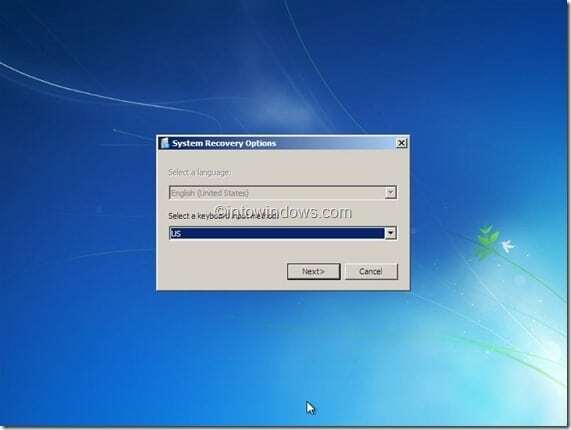 While the first option lets you restore a system image, the second option lets you reinstall Windows OS without having to enter the product key. 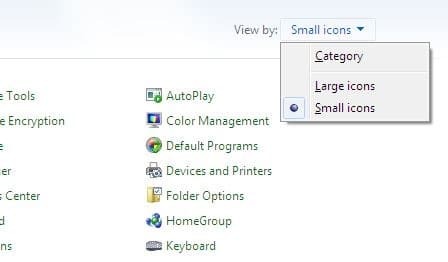 Simply select the second option titled Reinstall Windows and then press Enter key. 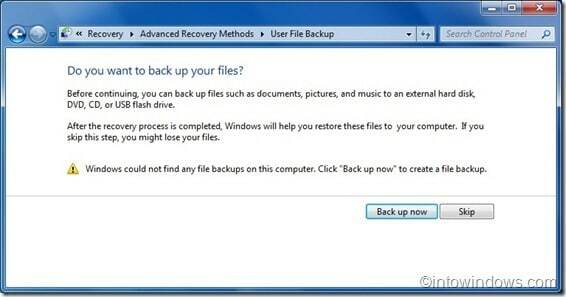 Step 6: The following screen warns you to back up your important data before reinstalling Windows. Even we recommend you backup all important data but since we’re not going to delete existing files and folders located in Windows 7 drive, you don’t necessarily need to backup data. Simply click Skip button to continue. For those who’re curious, in this method, Windows installer simply moves all files and folders located currently in the Windows drive to a folder named Windows.old on the same drive. And once reinstallation is done, it even allows you recover those files and folders but not applications from the Windows.old folder. Step 7: Finally, insert your Windows 7 DVD into the drive before clicking the Restart button. NOTE: You may need to make necessary changes to the BIOS/UEFI to allow booting from DVD. 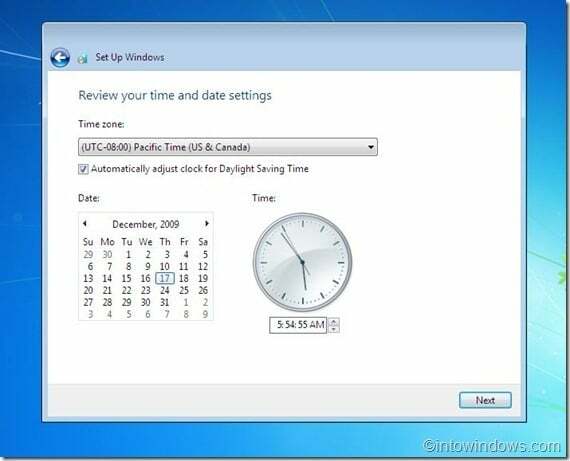 Step 8: After booting from Windows 7 DVD, you’ll see System Recovery Options dialog where you need to select a keyboard input method. Select a input method and then click Next button to continue. Step 9: When you see a dialog with “Are you sure you want to reinstall Windows?” message, simply click on the Yes button. 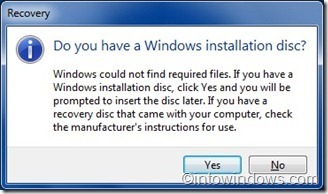 Next, you will see “Do you have a Windows installation disc” message, for which, you need to click the Yes button, since you already have inserted the right disc. Step 10: That’s it! Windows setup will start and begin reinstalling Windows. Once installation is done, you’ll see options to create user account, select time zone, and update settings. You won’t be asked to enter the product key. 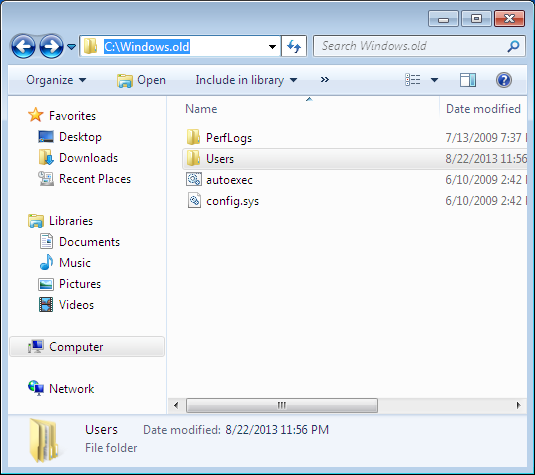 Finally, after completing the reinstallation, you can navigate to Windows 7 installed drive, and then open up Windows.old folder to move all important data from the old installation to the new one. 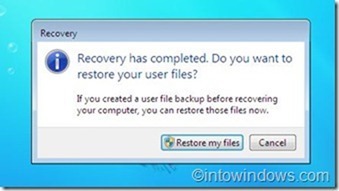 And if you did perform a backup, you can click on Restore my files button when you see the Recovery dialog on your desktop. 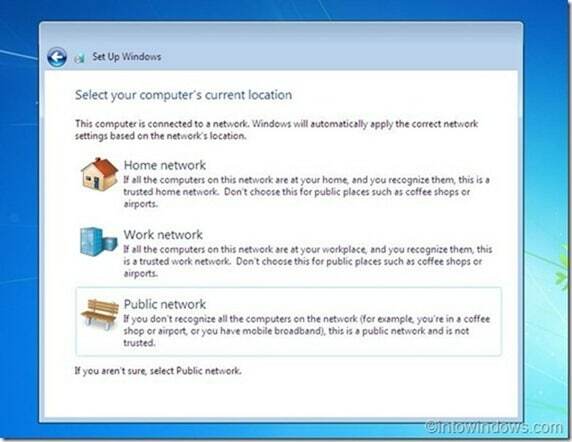 Step 11: Now that Windows reinstallation is done and you have all your data, it’s time to activate Windows. 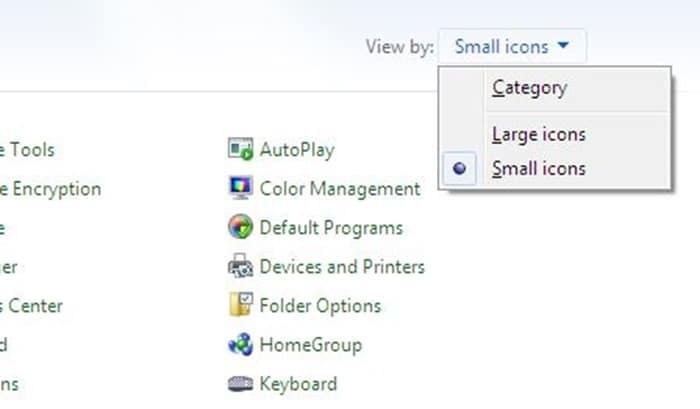 Simply open System Properties using Windows + Pause/Break key or right-clicking on Computer icon and then clicking Properties, scroll down, click Activate Windows to activate your Windows 7. In other words, you don’t need to enter the product key. Yes, you don’t need to type the product key! The unattended answer file contains an invalid product key. Either remove the invalid key or provide a valid product key in the unattended answer file to proceed with windows installation. Thanks. The instructions worked fine for me. your full of crap buddy it don’t work and now I lost everything I had on and still can’t activate windows without the product key it and it didn’t use the product key from the first installation jerk face. i successfully installed 64 bit win 7 CD i got of e-bay everything is updating fine (windows update) My system tells me it’s genuine however it didn’t ask me for my product key curious, I used belarc to get the product key for the CD and it was a different one than on my laptop. so can anyone please tell me is this a cracked version of windows? and is there a surefire way to tell? Thanks, tempted to start over now! Thanks. Very helpful information – something I should have known long ago but didn’t! Thanks again. I do appreciate it.. This did NOT work for me. It is requiring me to enter an activation key. For the record, I did not backup my files because the computer was riddled with viruses. Robert, you might be right. No offense but as far as I know, this method is also considered as reinstallation. 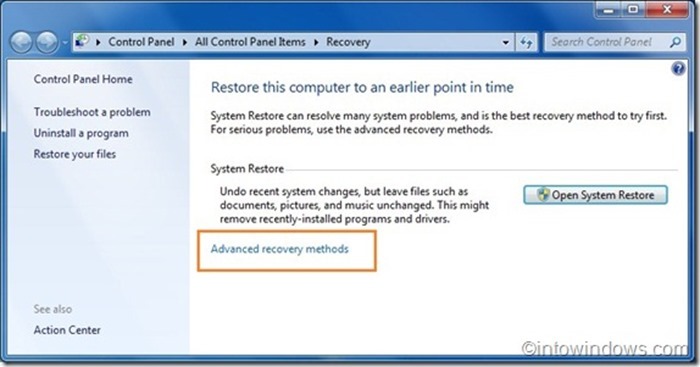 Even the option in the Control Panel also says this method as reinstallation. Your not really reinstalling without the product key. 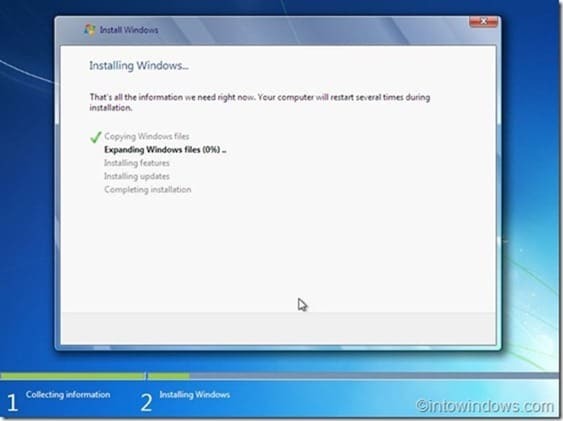 You are reinstalling by starting it from a working installation at which point it reuses the key already in place.